In this Book Rapper episode we discuss an important business book. Today we’re talking about Apple, and how to be the Apple of your industry. This is episode 034 of the Ideas Architect Podcast. 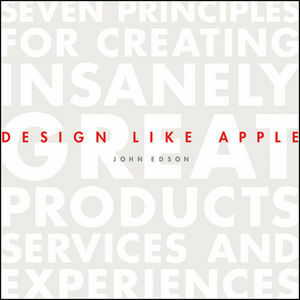 Our episode today is derived from the fabulous book Design Like Apple by John Edson. John is President at Lunar Design who have received numerous product design awards. Plus, they’ve worked with Apple as a client. John’s a keen sailor, cyclist and car lover. He started life as a mechanical engineer and then found design. Today, he’s a regular guest lecturer at Stanford’s D School. We share John’s seven simple principles for putting design at the centre of your organisation as modelled from industry giant and design innovators Apple. The three building blocks for how design makes the difference to separate you and position you to stand out in your market. How Apple designed their organisation around… design. And, three things you can do to follow their lead. The secret behind Apple’s great marketing and how they are able to consistently be seen amidst the noise of advertising, social media and global competition. Why Products are not islands and what to do about this to engage partners and boost emotional connection with your customers. The basic process for designing great things and why you should trash your spreadsheets. Three things Apple do to connect with your customers and ensure your product is a great fit for their lives. The one thing you need to bring all of this together into a cohesive whole.